The snow fort with its infantry is not complete without the artillery. A set of mortars, or cannon, placed in the fort to hurl snowballs at the entrenched enemy makes the battle more real. 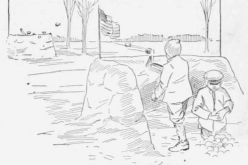 A device to substitute the cannon or a mortar can be easily constructed by any boy, and a few of them set in a snow fort will add greatly to the interest of the conflict. The substitute, which is called a snowball thrower, consists of a base, A, with a standard, B, which stops the arm C, controlled by the bar D, when the trigger E is released. The tripping of the trigger is accomplished by the sloping end of D on the slanting end of the upright F. Sides, G, are fastened on the piece F, with their upper ends extending above the bar D, to prevent the latter from jumping out when it is released by the trigger. 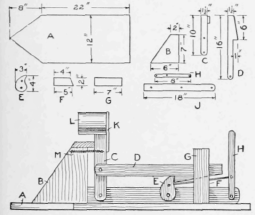 The trigger E is tripped with the handle H, connected to the piece J, on which all the working parts are mounted. The upper end of the arm C has a piece, K, to which is attached a tin can, L, for holding the snowball to be thrown. A set of door springs, M, furnishes the force to throw the snowball. All the parts are given dimensions, and if cut properly, they will fit together to make the thrower as illustrated.